As an unscheduled breakfast before venturing into a thunder storm for two days, it assumes previously unknown qualities – comforting, motivational and warming – not to mention a boost of caffeine and grease, those two staples of the UK diet. Our expedition to walk across the Howgill Fells had suffered from an inauspicious start. Gary had managed less than two hours sleep on the overnight train to Carlisle, thanks to the snoring passenger in his carriage. The bus that was supposed to take us from Kirkby Stephen to Ravenstondale had sped past – the driver oblivious to our frantic hand gestures – meaning an unwelcome trudge next to the busy A685 at 7am. Dark grey clouds were swirling overhead; an ominous sign that the unpleasant forecast was likely to be correct for once. Trying to delay the inevitable soaking, we wandered into the Black Swan Hotel in search of some comfort. Their delicious egg sandwiches rescued the trip from being abandoned in favour of two days in the pub, and all for a bargain three pounds each. After draining the last drops from the teapot, we set off through Ravenstondale, which sits on the northern edge of the Howgill Fells. The day’s route was undecided, with no particular summit or ridge in mind. All we had planned was to ramble through territory unknown to us both until we found a suitable place to wild camp. The following day, we would complete whatever distance remained to Sedbergh, located on the southern side. This approach to walking makes a refreshing change from a fixation on one mountainous target, or having to be back by a certain time for the bus. No rush, no pressure and time to enjoy the beautiful surroundings of the Howgills. You have probably seen these steep, tussocky hills, even if you didn’t realise it. Anyone travelling to Penrith from the south will have noticed them sloping away to the right, opposite the more dramatic skyline of the Lake District. These fells are often overlooked in favour of their illustrious neighbours to the west, but this is to their benefit. They are much quieter, unscarred by a criss-cross of ever widening footpaths and, in the central valleys, offer a sense of solitude that is hard to find in the Lakes. Fortunately, the forecast rain didn’t arrive until we reached The Calf, the highest point in the Howgills at 676 metres. Despite it being just past lunchtime, we decided to head for Bran Rigg to camp for the night – an afternoon doze suddenly seemed very appealing, with the rain getting heavier by the minute. A flattish hollow next to the small stream looked promising, with views down the valley to Castley and Crook of Lune – at least when the rain stopped for very brief interludes. The three dead sheep just upstream didn’t deter us – it was the only space large enough for two tents in this steep sided, v-shaped valley, and neither of us wanted to walk any further that day. The bright sunshine next morning lasted long enough for us to take down the tents and have breakfast. By the time we reached the top of Brant Fell, however, the clouds had settled in for the day, making themselves comfortable on the rounded plateau between Arant Haw and The Calf. Heads down, we moved swiftly to the top of Cautley Spout, the highest waterfall above ground in the UK (Gaping Gill is bigger, but in a cave). This is one of the highlights of a trip to the Howgills; the path down sits alongside the series of falls, and the best viewpoints marked by the worn-away patches of grass where previous admirers have tried to capture the perfect photo. 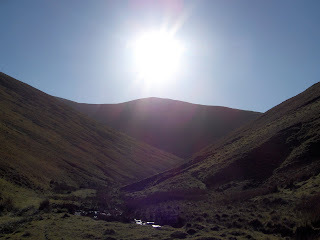 The sun returned for the final stretch, along the valley from Cautley to Sedbergh. 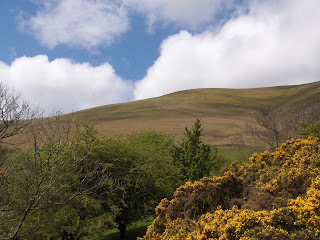 The warming rays lifted the scent of wild garlic into the woodland air, and wild gorse coloured the fields stretching up towards the Howgills. The contrast with the walk in to Ravenstonedale couldn’t have been starker – or maybe the warm, feel-good glow of the egg sandwiches was still working its magic. They really were that good. Kirkby Stephen Station is on the Leeds-Carlisle line, and there are occasional buses to Ravenstonedale (when they stop!). Sedbergh is served by many buses to all nearby towns and several villages. There are regular buses back to Kirkby Stephen to get a train home. Where to eat, drink, sleep There's nowhere that near Kirkby Stephen Station, but the Black Swan Hotel in Ravenstonedale offers a very warm welcome. Sedbergh has a wide selection of accommodation and places to eat, drink and be tired.